GeoMind designs and develops 3D mapping and geo-localizing applications with advanced tracking, routing and augmented reality capabilities. The highly detailed 3D map and the fluidity of navigation are just two of the many features that make our apps stand out from all the others on the market: the 3D terrain model is based on the best Open Source elevation data available from major European , global mapping and geo-spatial agencies. This model is covered by our topographic map gCARTA, based on the OpenStreetMap database for the paths, viability and points of interest. 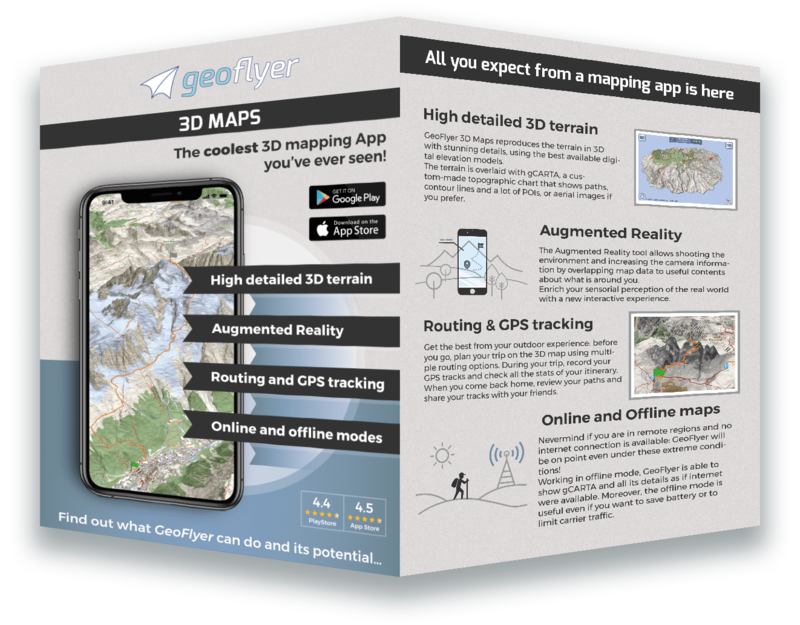 The highly detailed 3D map and the fluidity of navigation are just two of the many features that make our apps stand out from all the others on the market: the 3D terrain model is based on the best Open Source elevation data available from major European , global mapping and geo-spatial agencies. This model is covered by our topographic map gCARTA, based on the OpenStreetMapdatabase for the paths, viability and points of interest. The Augmented Reality module, within our applications, increases the perception of the real world thanks to interactive contents that the user can visualize with a simple touch on the screen. The possibility of superimposing the virtual 3D view, in transparency on what has been taken from the camera, transforms Augmented Reality into Mixed Reality, in which a merging of the real and virtual 3D worlds occurs, allowing wider possibilities for interaction between the user and the surrounding environment compared to “normal” augmented reality. GeoMind has developed and is owner of all the technology with which these applications have been realized and as a consequence, any adaptation is possible: starting from the data and contents provided by the customer, we are able to create custom-built 3D, multilingual, applications with the logo and name required by the client, with ad hoc functions and back-end services, when needed.